Edward's watching আপনি. . Wallpaper and background images in the Critical Analysis of Twilight club tagged: twilight funny edward cullen robert pattinson. This Critical Analysis of Twilight photo might contain রাস্তায়, শহর দৃশ্য, শহুরে, বাগান মই দিয়া আহরণ করা, পিক, and খনিত্র. 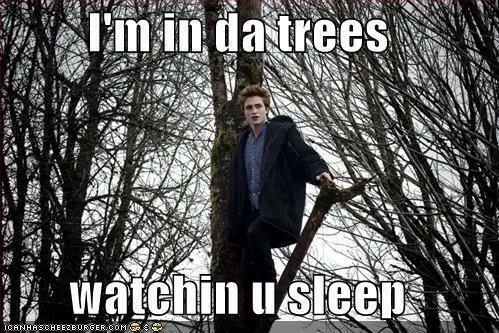 no you cant do that all edward cullen fanatics would like mega kill you and i do not want you to die plenilunio. I'm scared to go outside now...my house is surrounded by trees. Oh dear. I've got a huge tree in my backgarden that is next to my bedroom window. I am actually frightend. I am going to steal my sister's plastic Harry Potter wand everytime I go outside...bwah ha ha. Im never going to sleep then!